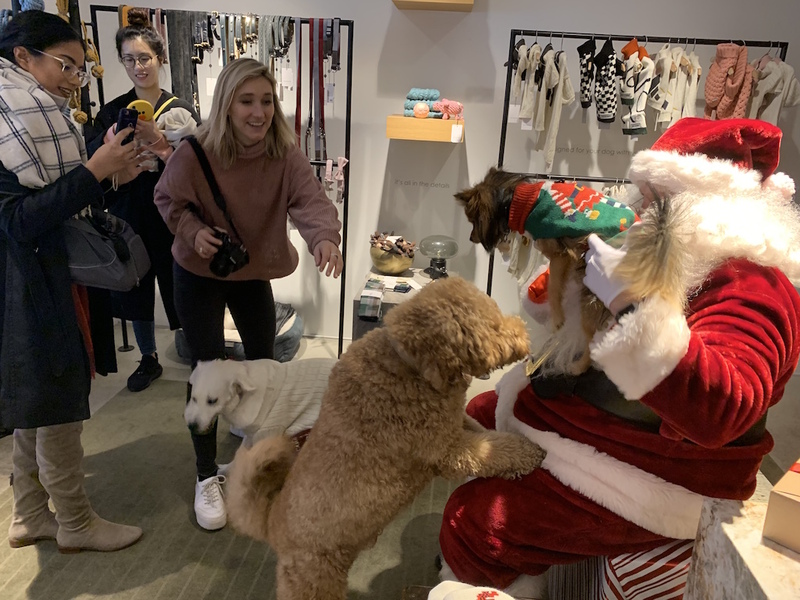 In New York—where dogs can have as many as a million Instagram followers and even accounts with just 50,000 can fetch $1,000 per post— it’s the season for dog moms to make merry. This past weekend, Max-bone, a pet accessories store in Soho where dog bow ties run $45, hired a human Santa to pose with four-legged Manhattanites. One of those waiting to sit in Santa’s lap on Saturday was Apple,a Yorkshire Terrier who was herself dressed in a Santa outfit and a bow. “Little girl, I’m not here for me, come on,” Apple’s dog mom said as Apple wandered away. A slinky white Golden Retriever named Summer also got carried away in the puppy mosh pit in front of Santa, so her parent kneeled down to reprimand her. “Summer, no barking, okay?” the woman said calmly, as if speaking to a five-year-old human child. Finally, Santa yielded to the dog scrum at his feet and got onto the floor for interaction and photo ops. A weeks-old French bulldog, swaddled in a blanket like a newborn baby, was placed in the crook of Santa’s arm and promptly nibbled on his white synthetic beard. “Does she have an Instagram?” asked a Max-bone employee. “Not yet,” the Frenchie’s dog mom said. The humans running prominent Instagram dog accounts say the term “dog mom” has really picked up in the past three to five years, moving from a tongue-in-cheek phrase to an accepted moniker. Dorie Herman, whose account The Kardoggians has over 160,000 followers, credits the internet for normalizing an attitude she’s always held towards her dogs. “Now it feels like the mindset of everyone else has caught up to me,” she said. This past weekend was a winter wonderland for the New York canine community. 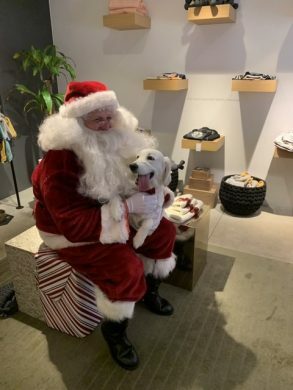 In addition to the Max-bone event, dogs joined in their own version of SantaCon– a “Santa Paws” event in Madison Square Park– and the Alphabet City dog-friendly cafe Boris and Horton hosted a dog-mom gift exchange. Chernick calls herself the “momager” of her two golden doodles, Charlie and Sawyer, whose Instagram account has 100,000 followers. The dog-mom gift exchange had the feel of an elementary school cafeteria event: dozens of people in sweaters, a flurry of heat and activity, and occasional admonishments from parents to their rambunctious dogs playing in mad swirls around the adults. Later, dog parents swapped gifts, and each person took home one present for humans and one for dogs. 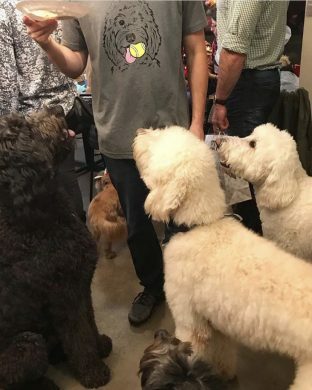 “Since we don’t have kids we’re not really part of a school community, and we’re not very involved in our church, so this is a great community for us,” said Chris Kroeber, who runs an Instagram under the handle Baileydoodle for her and her husband’s two dogs. 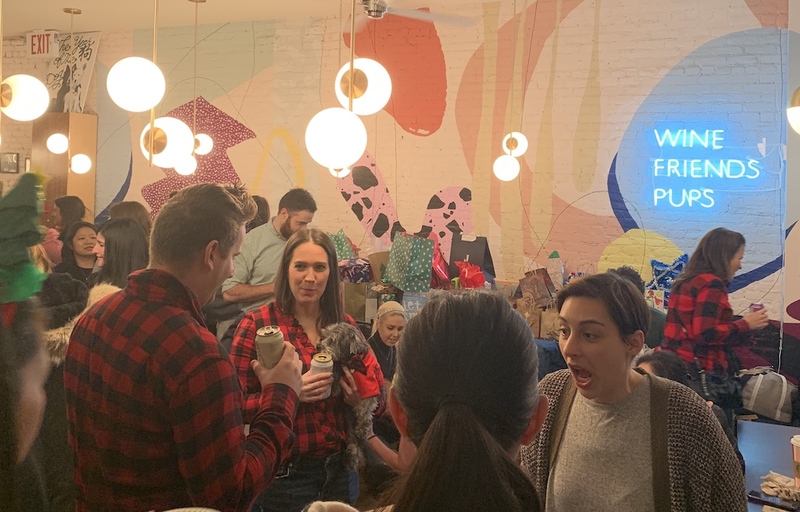 The owners of Boris and Horton say building community was one of their goals.“ Dogs sort of break the ice,” co-owner Coppy Holzman told Grub Street when the café opened. Gift exchange attendees took the opportunity to snap group photos with other dogs of the same breed for their social media accounts, a common occurrence at these events. Some dog moms schedule regular breed-specific meetups in the city. On Sunday, dog mom Instagram was filled with photos of the weekend’s festivities. “Such a great party!” @bradleydoodleman commented on Chris Kroeber’s photo on the Baileydoodle page.